(CNN) -- Two pilgrims from Iran have contracted the H1N1 virus, according to reports from the country's official news agency. 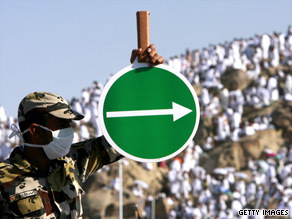 December 2008: A Saudi policeman directs pilgrims at Mount Arafat, southeast of holy city of Mecca. Every year about two million Muslims go on pilgrimage to Mecca -- the holiest place in Islam. As well as the annual Hajj pilgrimage, which all Muslims are required to make at least once if they can afford to, the faithful can also make a lesser pilgrimage to Mecca, known as umra, at any time of the year. Iran's official Fars news agency Wednesday reported that a 57-year-old woman and a 24-year-old man who had recently returned from a pilgrimage tested positive for the H1N1 virus, also known as swine flu. This brings Iran's tally to three cases. The latest cases highlight concerns that the Hajj pilgrimage will hasten the spread of swine flu. In June, host country Saudi Arabia held a workshop where health officials recommended that pregnant women, children and elderly people with chronic illness should not attend the pilgrimage this November. In addition, officials are recommending that visitors to the country receive a seasonal flu vaccine at least two weeks before traveling to the holy places. Gregory Hartl, Team Leader for WHO's H1N1 Communications told CNN: "We are distributing to all countries the advice that Saudi Arabia itself has put out for Hajj season." Rates of infection in the Middle East, however, are still relatively low standing at just over 1100 cases, with no reported deaths. And in Saudi Arabia the total number of reported infections currently stands at just 114. On Monday, the country shut an international school after 20 students were diagnosed with the Influenza A(H1N1) virus. Saudi Arabia is also keen to reiterate general hygiene advice including cough and sneeze etiquette (covering the nose and mouth), use of antiseptic hand gels and frequent hand washing with soap and water. The latest World Health Organization figures estimate that the worldwide infection rate is approaching 100,000 with 429 recorded deaths. But concerns must persist about countries with large Muslim populations and higher levels of swine flu infection. The U.S., for example, tops WHO's swine flu table with more than 37,000 reported cases. The Web site for the Saudi Arabian Embassy in the U.S. states that nearly 12,000 visas were issued for Hajj in 2008. In the UK, the Foreign and Commonwealth Office Web site report that around 25,000 British Muslims attend Hajj every year. The UK is the third in WHO's swine flu table with more than 9000 reported cases to date. In light of this, the Muslim Council for Britain told CNN that they will be publishing advice to British Muslims wanting to travel to Hajj shortly. Fears about the spread of swine flu during Hajj extend across the whole Middle East region and governments have been quick to publish guidance. Bahrain and Oman have both issued similar advice to Saudi Arabia, and the United Arab Emirates are set to launch a swine flu awareness campaign in the run up to Hajj. Saudi Arabia has already put in place quarantine facilities at major airports in the country so that pilgrims suspected of carrying swine flu can be safely isolated.